St. Vincent was born of poor parents in the village of Pouy in Gascony, France, about 1580. He enjoyed his first schooling under the Franciscan Fathers at Acqs. Such had been his progress in four years that a gentleman chose him as subpreceptor to his children, and he was thus enabled to continue his studies without being a burden to his parents. In 1596, he went to the University of Toulouse for theological studies, and there he was ordained priest in 1600. In 1605, on a voyage by sea from Marseilles to Narbonne, he fell into the hands of African pirates and was carried as a slave to Tunis. His captivity lasted about two years, until Divine Providence enabled him to effect his escape. After a brief visit to Rome he returned to France, where he became preceptor in the family of Emmanuel de Gondy, Count of Goigny, and General of the galleys of France. In 1617, he began to preach missions, and in 1625, he lay the foundations of a congregation which afterward became the Congregation of the Mission or Lazarists, so named on account of the Prioryof St. Lazarus, which the Fathers began to occupy in 1633. It would be impossible to enumerate all the works of this servant of God. Charity was his predominant virtue. It extended to all classes of persons, from forsaken childhood to old age. The Sisters of Charity also owe the foundation of their congregation to St. Vincent. In the midst of the most distracting occupations his soul was always intimately united with God. Though honored by the great ones of the world, he remained deeply rooted in humility. 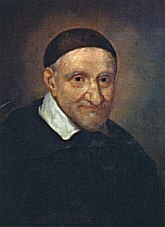 The Apostle of Charity, the immortal Vincent de Paul, breathed his last in Paris at the age of eighty. His feast day is September 27th. He is the patron of charitable societies.